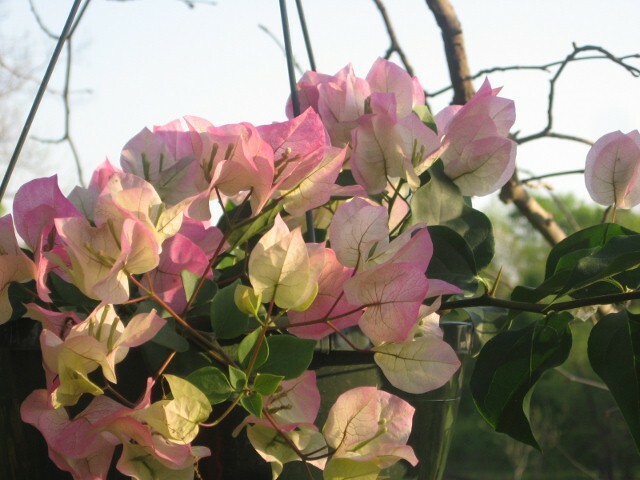 I wanted to write and thank you for the beautiful basket of Bougainvillea that you brought me on Easter Sunday. 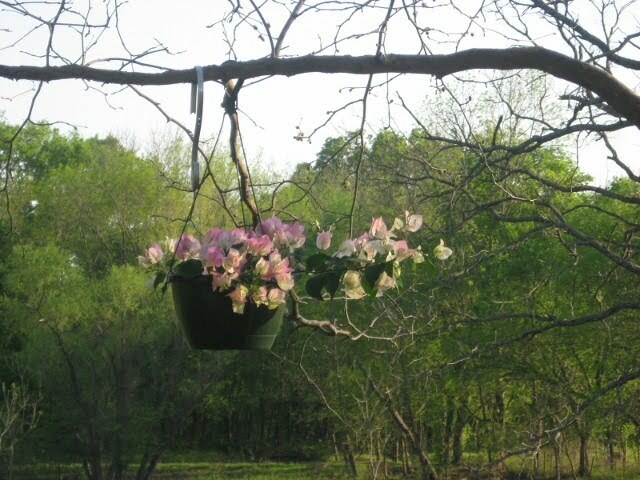 I hung it on a branch on the sycamore tree beside my birdfeeders and it is gorgeous. 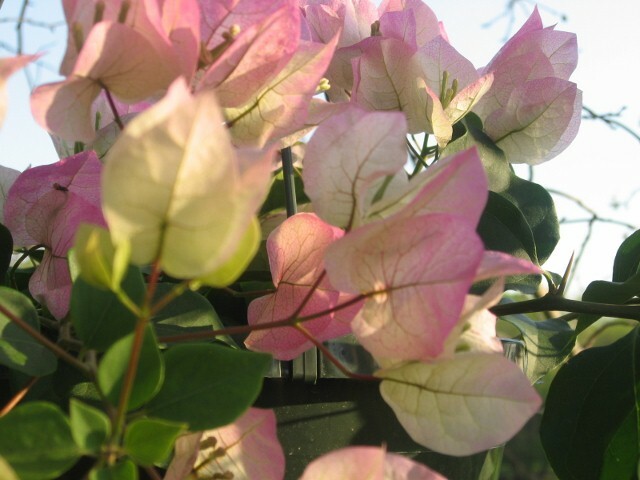 Its pale green and pink petals fluttering in the spring wind remind me of ruffles on a little girl’s Easter dress. Didn’t it seem to you that spring green burst out of nowhere? It seemed sudden and I have been enjoying the sunny skies and warm breezes. The oak trees have unfurled their leaves like green pennants and catkins shower pollen on the newly mown grass. 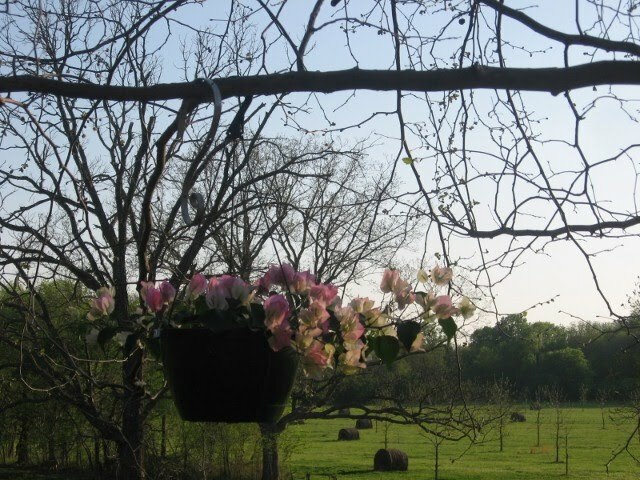 The pecan trees and the sycamores are just “breaking bud” as Dad would say. The tulips have nodded in the wind until their petals dropped, and the redbud tree out front has begun to shed pink, the color of frosting on a strawberry cake, in a circle beneath its branches.The purple iris are blooming, and today a first yellow rose bud popped open on the bush outside the picture window. The azaleas are opening and they will soon be a splash as bright red as a cut ripe watermelon beside the white of the house. The best thing about the flowers you sent me is the fact that you bought them for yourself and then loved them so that you decided to part with them. You were thrilled with the blooms, yet knowing I would love them you gave them to me. I know it was a gift from your heart. The flowers have given me joy, just like having you for a daughter does. What the heart gives away is never gone…It is kept in the heart of others. Elece Hollis.com, Blog at WordPress.com.